After years of collecting, I've learned that the best toys sometimes come in the plainest of boxes. The simple cardboard container below gives no hint of the beautiful antique toy within. 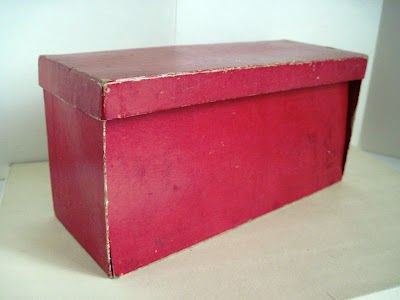 It measures 5 inches tall by 9 1/2 inches wide. 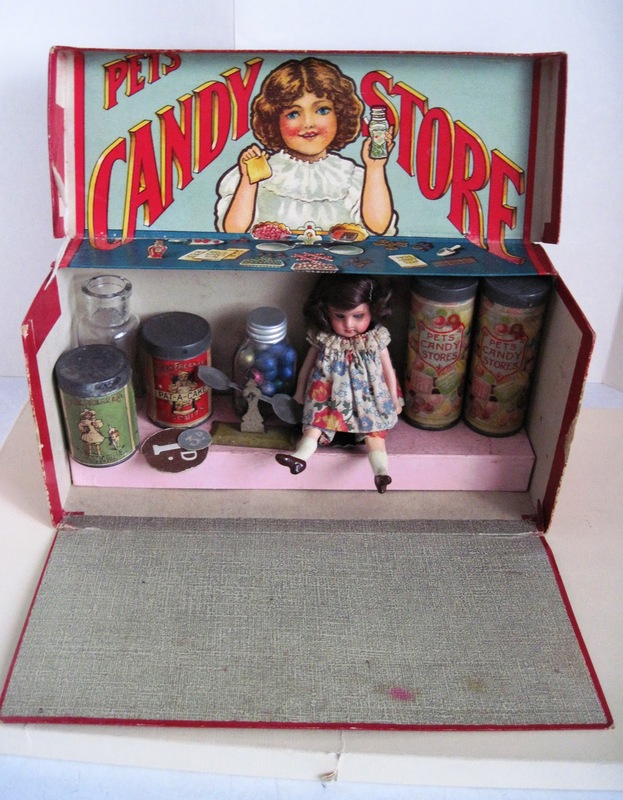 When the lid is lifted back, the front panel drops, revealing Pets Candy Store, a miniature shop made in England circa the 1890s. 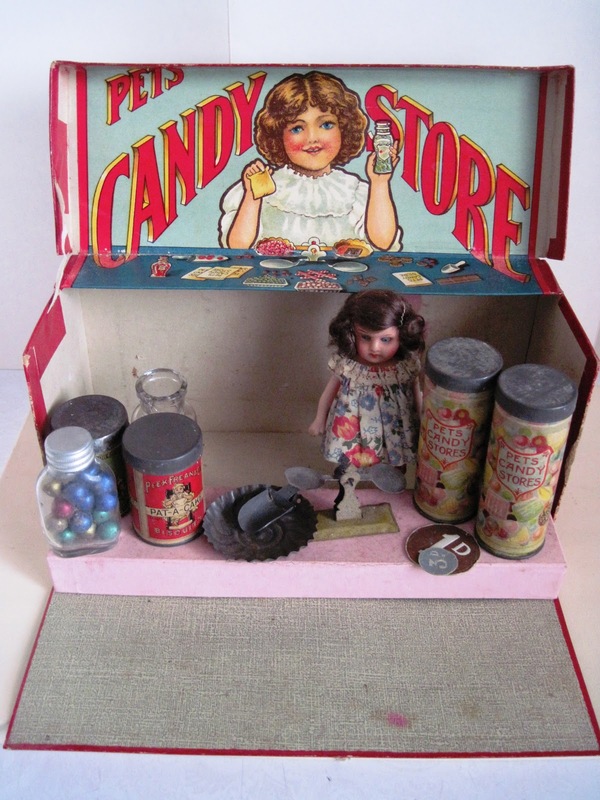 To set up the shop, a pink candy counter slides out of the base. 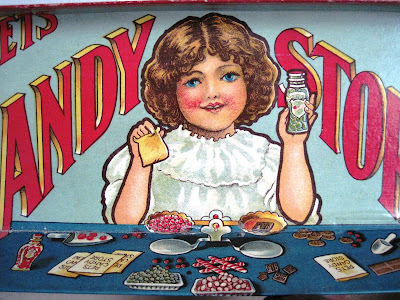 Then the counter can be set with its accessories, including tin candy and biscuit containers; glass bottles of faux candies; a tin scale, scoop, and dish; and cardboard coins. All the accessories are original to the store. The doll was added later but suits it perfectly, a close match to the little girl depicted on the shop's lithographed sign in the box lid. 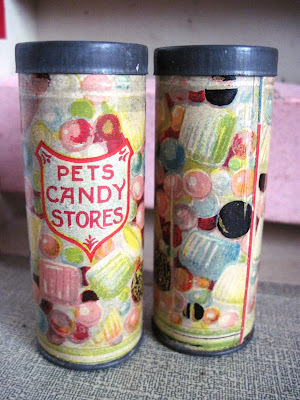 Some of the containers originally held real candies and biscuits, fossilized remnants of which were still intact when I opened them. The tiny Peek Frean & Company biscuit tins are two inches tall. The Pets Candy tins are a bit bigger at 3 1/2 inches tall, and feature colorfully lithographed labels. A little glass bottle holds faux candies made of gilded wood. 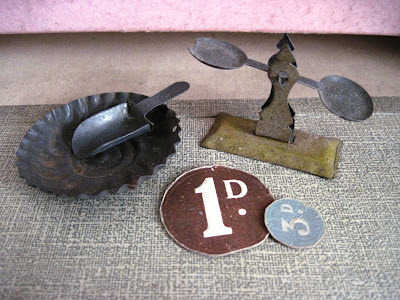 Completing the set are tiny tin accessories including a scale, molded dish, and scoop, along with cardboard coins. 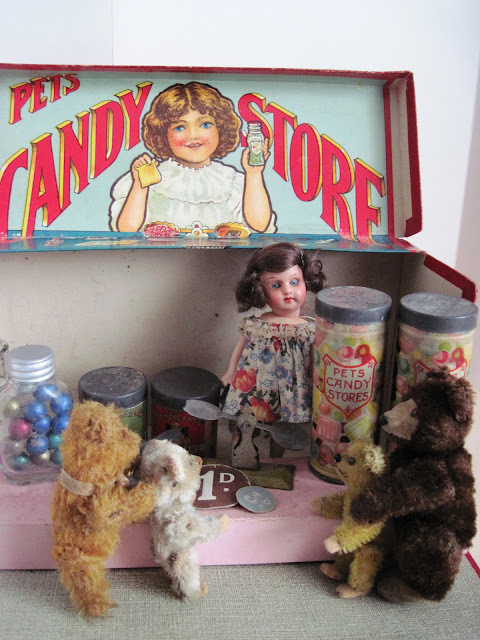 The shop is the perfect size for miniature teddy bears in search of sweets. What a neat blast from the past. Thank you for sharing. 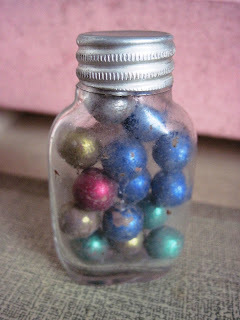 What a great find, it really is extra special. 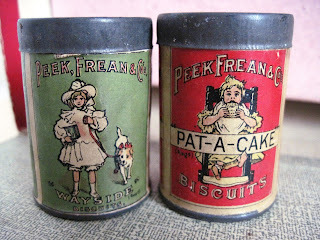 The tiny teddies look very excited at the prospect of sweets - fossilized or not! Just catching up, wow is this special.